Vortex beams have an isolated phase singularity of the center of the optical field, leading to null intensity at the beam center. 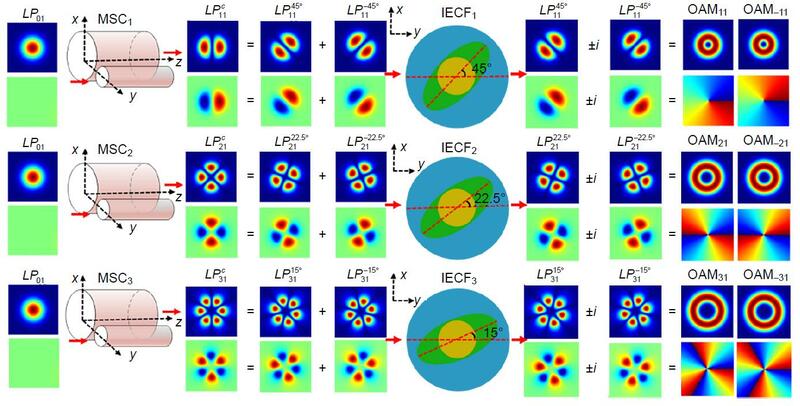 Due to the possessing of orbital angular momentum (OAM), OAM beams have found potential applications in optical tweezers, optical manipulation, microscopy, quantum information processing and classical and quantum communications, etc. In consideration of the potential application, highly efficient generation of vortex beams become very meaningful. For the generation of vortex beams, vortex mode converter such as spiral phase plate, spatial light modulator, cylindrical lens pair, and q-plate, can convert the Gauss fundamental beam to vortex beams. By contrast, fiber based methods possess the advantage of simpleness, easier integration and low cost, etc. The research group of Prof. Anting Wang from University of Science and Technology of China (USTC) proposed a novel orbital angular momentum (OAM) mode converter that is easy to be fabricated with the existing optical-fiber drawing techniques. The designed all-fiber based mode converter is composed by a mode selective coupler (MSC) and an inner elliptical cladding fiber (IECF) for generating vortex beams. The MSC is used to generate the LPlm modes, where l denotes the azimuthal index and m represents the radial index, and then the IECF can introduce ±π/2 phase difference between two degenerate orthogonal modes after a certain propagation length. By adjusting the parameters and controlling the splicing angle of MSC and IECF appropriately, the higher-order OAM modes with topological charges of l = ±1, ±2, ±3,… can be obtained with fundamental mode injection, featuring a mode conversion efficiency of almost 100%. This work may pave the way towards the potential application as a compact, all-fiber and high-efficiency device for increasing transmission capacity and spectral efficiency in optical communication systems with OAM modes multiplexing. The research group of Prof. Anting Wang and Prof. Hai Ming belongs to the school of physical sciences of USTC and Anhui key laboratory of optoelectronic science and technology. The group is dedicated to fiber optics, optical vortices, 3-D display, and laser display. They aims to develop innovative technologies in advanced display prototype, CW/ultra-short pulse fiber lasers and various applications. They have published/co-published more than 100 papers, 40 conference papers, and 50 patents. Chen R S, Wang J H, Zhang X Q, Yao J N, Ming H et al. Fiber-based mode converter for generating optical vortex beams. Opto-Electronic Advances 1, 180003 (2018).